At 105 years, James Kashorda is full of energy. He celebrated his birthday last Saturday in Enoomatasiani village, Kajiado county. Kashorda has never tasted alcohol or smoked cigarettes in his entire life because he sees no value in them. His memory of events and dates is strikingly exemplary. In 1948, his uncle told him to get a woman to marry because he was growing old. Instead of searching for one, he told his uncle to look for at least three of them so he could choose one from them. “When I set my eyes on Tabitha, one of the three selected by my uncle, I knew she would be my choice for life. Indeed, I married her. My relatives fixed everything for me to have a church wedding in Kikuyu, and I had my final reception in my Enoomatasiani home,” he says. During the reception in Olkeri ward, Kashorda said he invited very many close friends, and among them was the late Eliud Wambu Mathu, the first African member of the Legislative Council of Kenya, who represented Central Province. The politician’s wife is the younger sister of Kashorda’s wife. Mathu was a former teacher, civil servant and later a politician who served in LEGCO from 1944 -57. Former President Daniel Toroitich Arap Moi was the council’s member for Rift Valley. “While in my wedding reception at my house, I spotted the late founding father of the nation, Mzee Jomo Kenyatta in the crowd. I had not invited him but I guessed Mathu brought him around. It was a big event with a crowd that had never been seen in Kajiado,” Kashorda said. At the time, Mzee Kenyatta was a pan-Africanist and was trotting the globe, giving lectures abroad on why Africans should have their own governments. Kashorda’s wife is a daughter of the late Barnaba Nyoike, who is the father of Kimani Wanyoike. Kashorda’s father paid his son’s dowry in Matapato, giving out 12 cows to Nyoike before he allowed his daughter to leave his house. On marrying his wife, a friend gave Kashorda 50 acres, on which he has established a home. 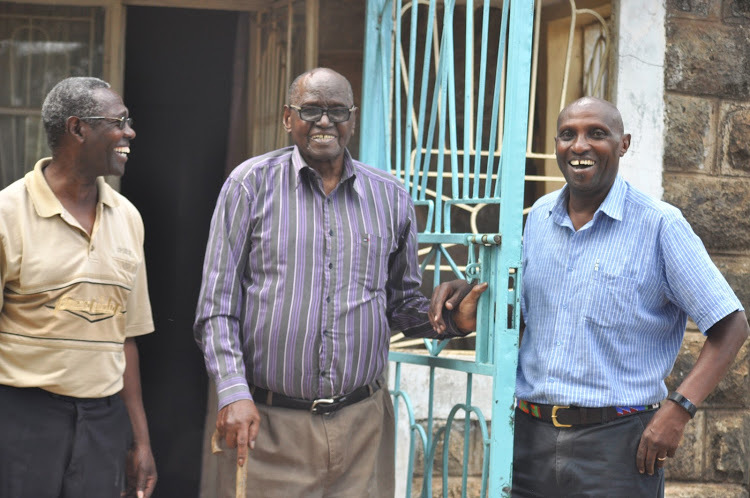 Two years after his wedding in 1950, Kashorda joined Ngong Veterinary Training Centre, where he trained on hides and skins after he was invited by Dr Mann. After training, he worked for one year and later in 1952, he was appointed by the colonial government to sit in the Ngong Court Tribunal, along with two other people he only named as Sayioki and Kiok. Their role was to moderate cases against the natives in a court that had a white magistrate. “After serving for one year, I said I will not continue serving an institution that was full of corruption. In one year alone, we ate more than 300 goats given to us as bribes so we can irregularly overturn certain cases. I said let me be poor and serve my only living God in my church,” Kashorda said. He says in 1952, when the government declared a state of emergency, all the Kikuyus in Kajiado’s Ngong area were chased away. He was not touched because it had become known all over he was the son of a Maasai. In 1963, Olkejuado County Council employed Kashorda as its revenue clerk in its Ngong office. His duties were to collect cess and rent from the council houses. “Rent at the time was Sh2 per month for most of the houses. In 1964, land adjudication was done in Ngong and the surrounding areas of Ongata Rongai, Kiserian and Matasia. I worked with the council for 20 years and retired in 1982,” Kashorda said.